We continue the Pray A to Z series, and N is for Neighbors. You can catch up on the entire series here. If you haven’t downloaded your Pray A to Z prayer cards, you may get those here. Also, in the theme of loving our neighbors, I have an exciting give away to share. I have a pack of 10 prayer postcards from Pathfinder Ministries to give to a reader! Pathfinder Ministries provides resources of hope for those going through difficult times, and direction for women who desire to live lives of purpose! The organization is led by Tonia Harrison – speaker, writer, and recent breast cancer survivor – praise God! 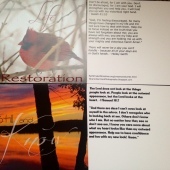 Tonia and her cousin, Sharon developed these post cards to encourage each other as they both journeyed through cancer. You can read their story here. When words failed, they found comfort in Scripture and prayer for each other. Each post card features a beautiful picture and quote, and a written out prayer on the opposite side. There’s room for you to write a small encouraging note to go with the card. Be sure to enter the giveaway at the bottom of this post! Five years ago, Kedron and I purchased an empty lot in a developing neighborhood. For four months, we drove up a barren street, and I would count for sale signs on the left to find our lot. Moving to this neighborhood was a complete re-boot for our family. We’d left Florida, moved back to Michigan, and were building in a new-to-us small town. Every time I drove to our building site, past all the empty lots, I wondered who would be our neighbors? Who would our kids grow up with? Who would they run through sprinklers, ride bikes, walk dogs, and play ball with? So, I prayed. I prayed over those empty lots, over the basements that were dug, and the frames constructed. I asked God to bring families onto our street, and friends for our kids. I asked that He might in some way use us to share His love with our future neighbors. Over the next two years, the lots filled. Houses built up around us, a new street was paved behind us, and even more houses built. Fantastic families moved into the homes and bikes scattered up and down the street. The builder built spec houses on the empty lots that didn’t sell. For about a year, three empty houses filled the lots to the right of us. Every day, I’d drive past these houses and offer up a short prayer for God to fill these empty homes with families too. Today, families fill all the homes. A day doesn’t pass where I don’t drive home and wave at neighbors visiting in driveways and kids playing in yards together. Our children have made new best friends and share weekly adventures in frog catching, fishing, running through sprinklers, snowman building, or games of football. When we’ve faced health challenges on our street, such as Kedron’s cancer surgery and another neighbor’s heart surgery, everyone pitched in to shovel snow off driveways and sidewalks. We’ve shared our table for meals, dropped off hot food after new babies, or in times of grief. I’ve offered warm hugs and quick prayers on chilly school mornings when I’ve noticed another mom’s sad demeanor. On Wednesdays, Kedron takes a carload of kids to a local church’s Awana program. At least half a dozen other neighbor kids attend as well. This Christmas, a handful of neighbor friends will join me at a women’s event a church, and a new families have started attending church with us. Our street isn’t perfect. We’ve had our fair share of tensions and misunderstandings, as are bound to happen when you live in proximity with people. Yet, there’s a level of support for each other that is a blessing, and what I see as answers to prayers prayed over empty lots years ago. Now, I pray for my neighbors by name as I drive up the street. Christ urged us to love our neighbors as ourselves (Matt. 22:26-40), reminding us that others will see Him as we love one another (John 13:34-35). No one sees our love for God more often and consistently than our actual neighbors. Often, that simply means showing up and being available. Write down the names of the families and individuals who live near you. Ask God to show you how you can practically love your neighbor this week. Ask God to give you courage to show up, bring a meal, or pray with your neighbors. Bring any tensions in your neighborhood to God and ask for His forgiveness and grace to reign. Pray for those who don’t know the love of God to see it through you. 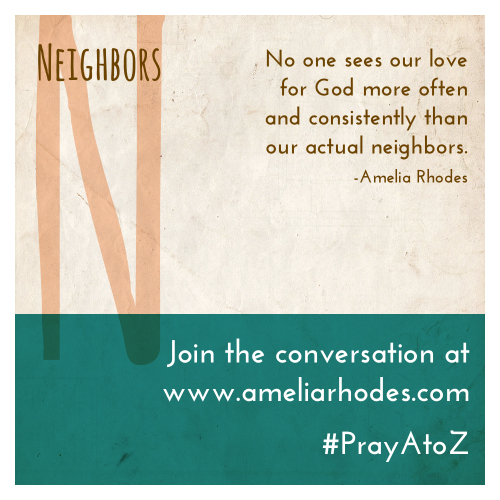 As we #PrayAtoZ, N is for Neighbors. How often I forget to pray for my neighbors. We talk, serve, help each other, but I don’t remember to pray for them. Thank you. Neighbors are an important part of our lives–praying for them should came natural. This is something I need to work on. Great reminder Amelia! We moved into a new neighborhood this year and it’s been hard to make first steps with most of them. We’re working on it though!